Vinaigrette: Whisk the garlic, mirin, vinegar, water and miso together to make a smooth paste. Whisk in olive oil and drops of lemon juice to taste. Season with salt, pepper and sugar. Beetroot: Preheat oven to 200 degrees Celsius. Trim beetroot and place in a roasting pan. Brush with one Tbsp of oil and sprinkle with salt and pepper. Roast for one hour or until very tender. Remove, cool and peel. Slice very thinly on a mandolin or with a sharp knife. 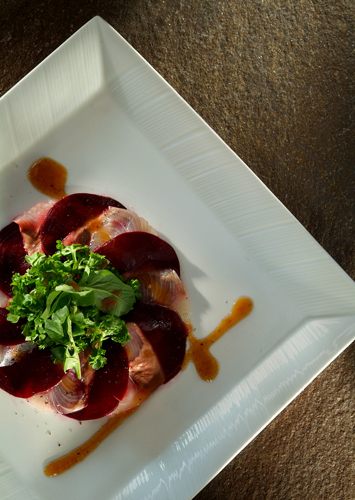 Arrange the beetroot and sea fish slightly overlapping in a petal pattern on 4 dinner plates.